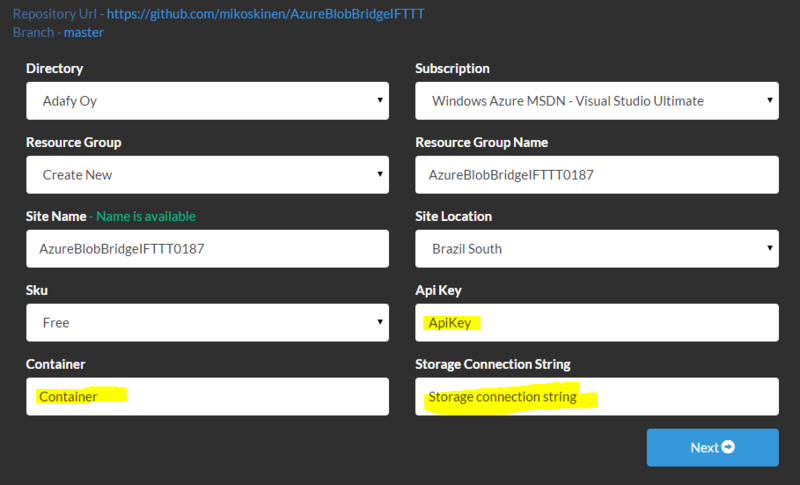 Azure Blob Bridge for IFTTT provides an easy way to use Azure Blob storage as a IFTTT output Channel (action). 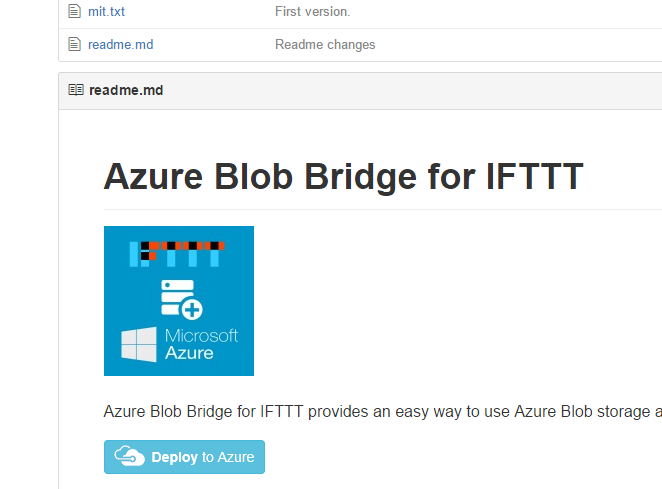 For introduction of the project, you can read the Azure Blob Bridge for IFTTT: Introduction. 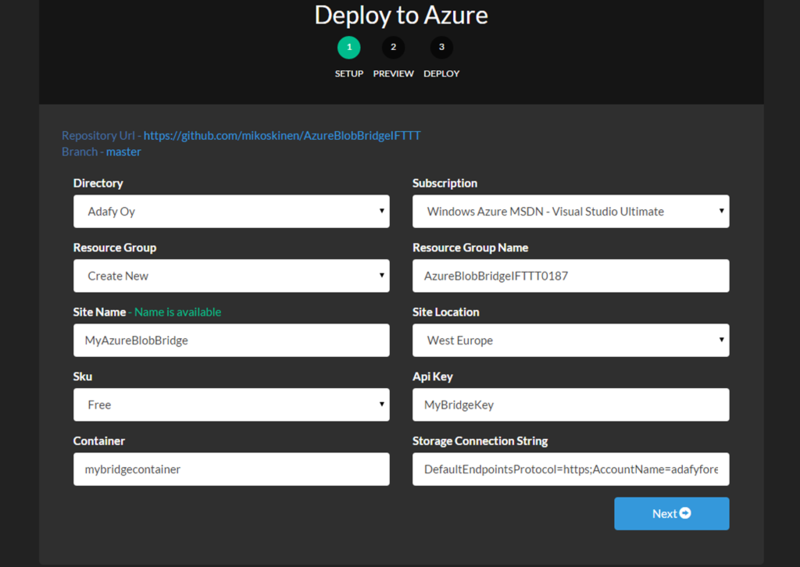 By following this tutorial you will connect the BBC’s RSSwith your Azure Blob Storage. ApiKey decides how the bridge is reached. Example: ApiKey = "hello" -> Your API works through http://yourdomain.com/api/hello. In this guide we will use MyBridgeKey. Container is the name of your Azure Blob Storage container where the blobs will be stored. The container will be automatically created if it’s missing. Deployment completed and shows you the Browse link. Click it to make sure that everything is working correctly. You should see text “Good to go!” if everything is up and running. If you see an error, make sure that the configuration is set correctly. Now we have a working Azure Blob Bridge for IFTTT. 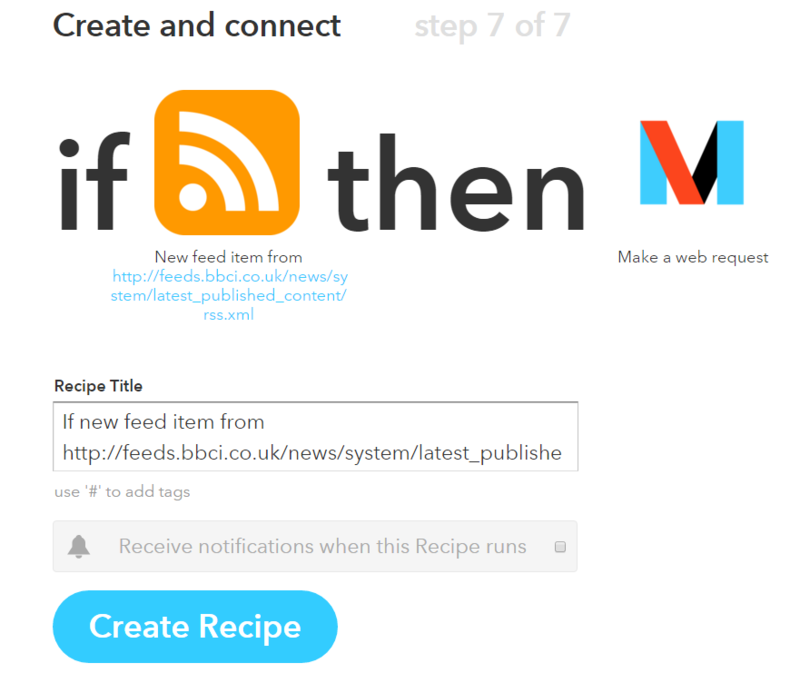 It’s time to setup the IFTTT. 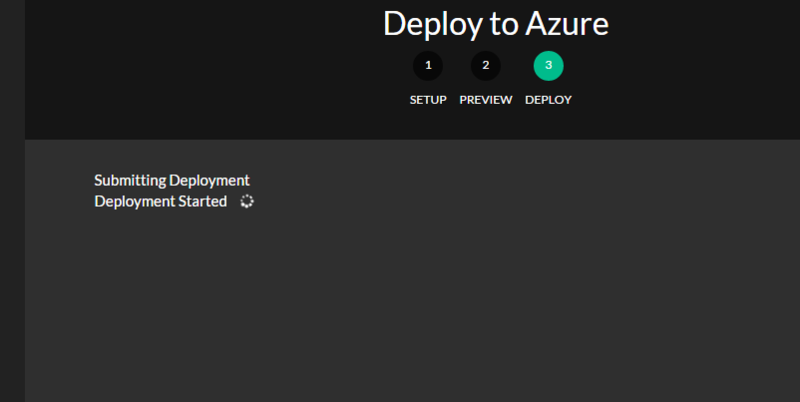 If you don’t want to use the “Deploy to Azure” button, you can clone the repo, create the Azure Web Site manually, set Web.config for the required configuration and push your repo to site. Select “Feed” and then click “New feed item”. 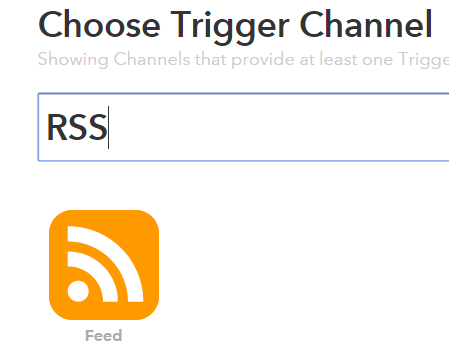 This way the trigger is automatically run everytime a new item is posted into the RSS feed. 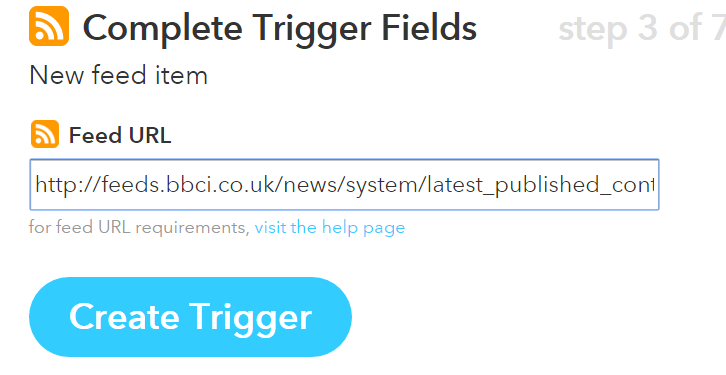 And finally select “Create Trigger”. You trigger is now ready. 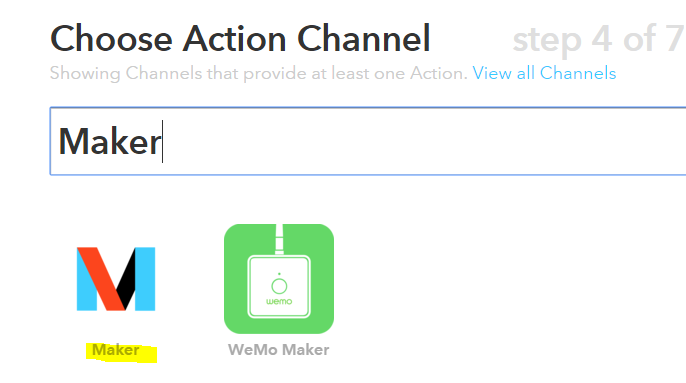 IFTTT lists all the available action channels. We will use Maker Channel to connect to our newly created Azure Blob Bridge. Now we must configure Maker so that it’s connected to our bridge. 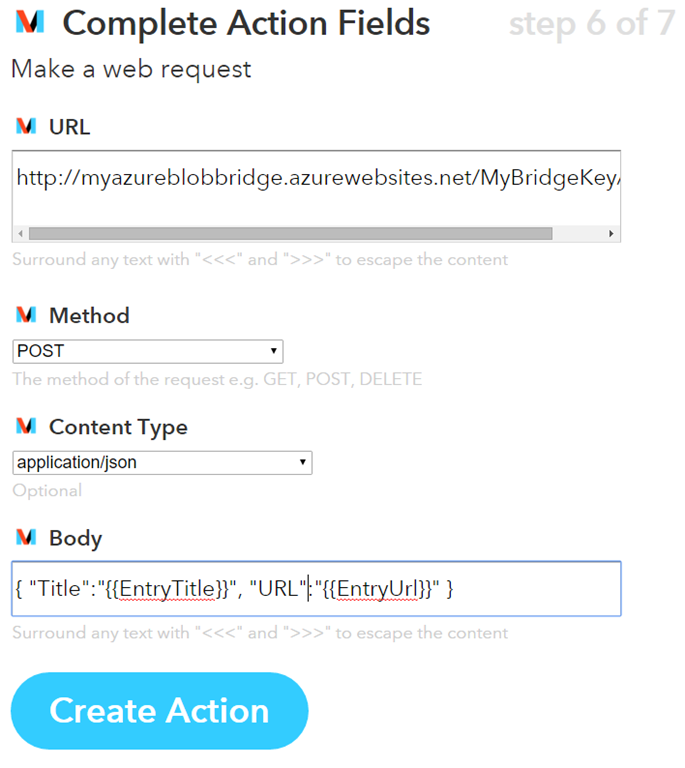 In the first part of the tutorial, we published the Azure Blob Bridge for IFTTT to url http://myazureblobbridge.azurewebsites.net/ and we used the Api Key MyBridgeKey. 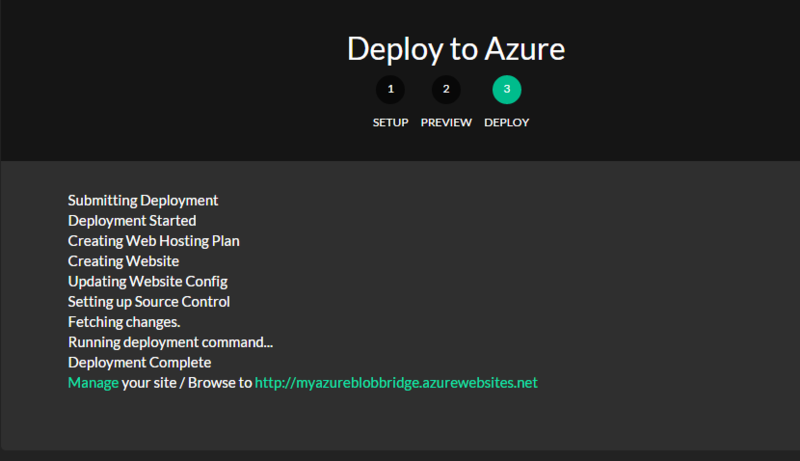 This means that the bridge is available through URL http://myazureblobbridge.azurewebsites.net/api/MyBridgeKey/. Fill that in. The bridge accepts POST requests, so select POST in Method. We want to store the new items as JSON-files, so select application/json in Content Type. 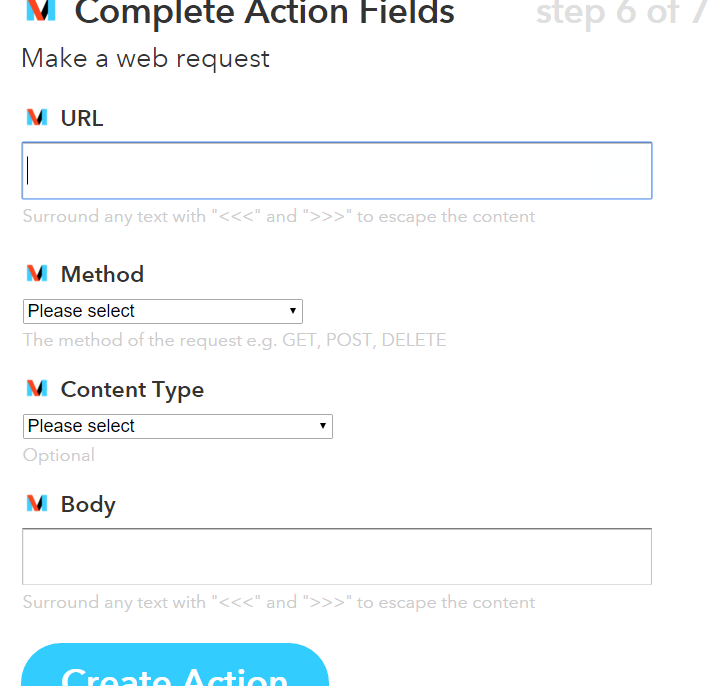 To finish the tutorial, select “Create Action” and then “Create Recipe”. 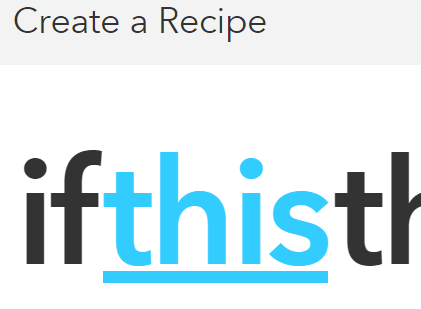 Using RSS as a trigger is just a one example of how you can use Azure Blob Bridge for IFTTT. IFTTT contains more than 240 channels which now can be connected with the Azure Blob storage. NXMLFormatter is an open-source XML Formatter and beautifier written with C#. The DLL is available as a portable class library, so you can use it from UWP, ASP.NET etc. Project doesn't have any external references and it uses only the features provided by the .NET Framework. NXMLFormatter is available through the NuGet with the package name NXMLFormatter. Type "install-package NXMLFormatter" to install it. Under the covers the library uses XmlWriter to format the code. The library is distributed under the terms of the MIT License (see mit.txt). NXMLFormatter’s source code is available from GitHub.